Beaten finalists in last year’s competition, Belvo dominated this contest – a repeat of the 2015 and 2016 deciders – from the get-go. 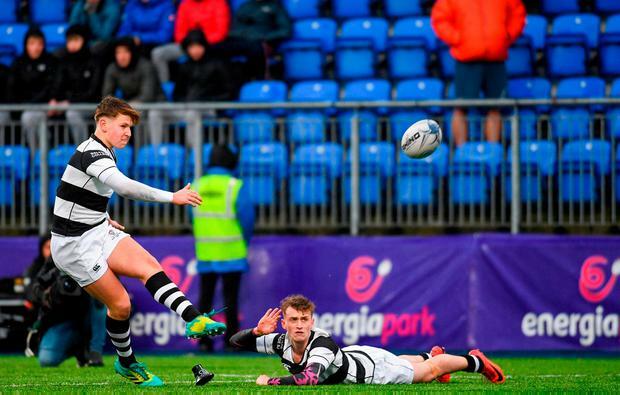 After fly-half Justin Leonard split the uprights off a routine penalty, Cailean Mulvaney and Matthew Grogan crossed over in spectacular fashion to give Belvo a 13-point buffer. 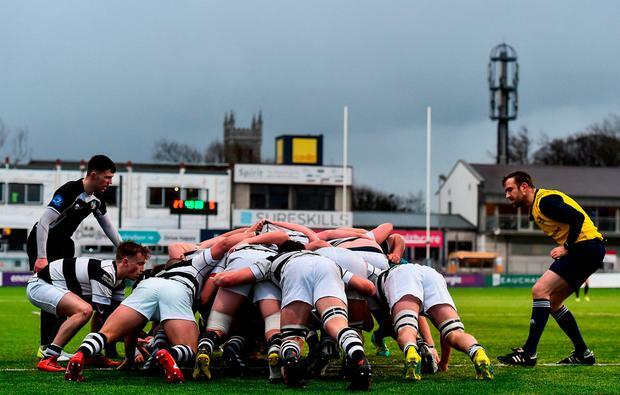 Roscrea fired back with a Diarmuid Kilgallen try but opposition full-back Rory Dwyer touched down under the posts. Leonard supplemented this score and he also converted a clinical Alekseiy Soroka try to give Belvo a 27-5 interval cushion. 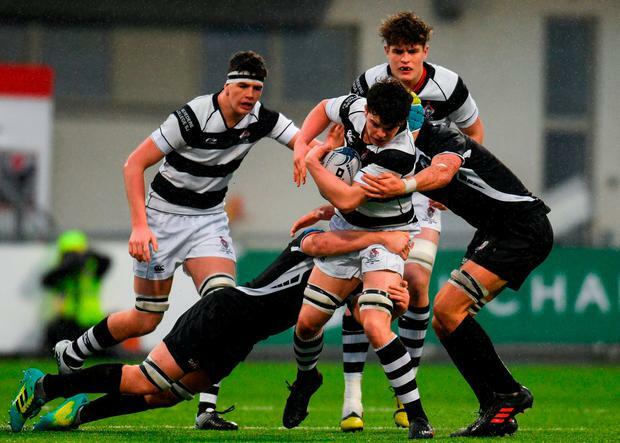 Roscrea were much-improved on the resumption as out-half Darragh Tynan released Kilgallen for his second try on 53 minutes. His midfield partner Billy Foley was on hand to convert, giving his side a glimmer of hope in the process but Aaron Coleman rounded off a breakaway Belvo move to seal the win. Belvedere Col – R Dwyer; D O’Grady, C Mulvaney (C Rogers h-t), J Meagher, M Grogan (D Hawkshaw 61); J Leonard, P Lysaght (J MacNiece 55); H Flood (M Galinski 55), A Synnott (J Sargent 62), C Cagney; A Soroka, J Jones (C Yalloway 55); C Kelly (J Ross 65), E Rutledge (B Jennings 48), A Coleman. 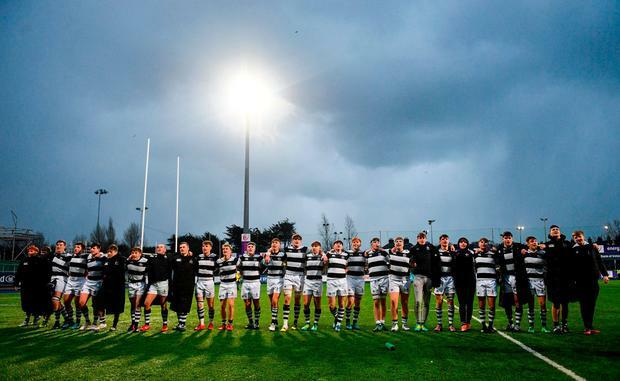 Cistercian Roscrea – D Keane (A Dunne 8); S Mallon (Z Whelehan 58), D Kilgallen, B Foley, B Murphy; D Tynan, J Matthews (C Bird 58); J Cahir (S Connolly 65), R Loughnane (C Power 65), J Egan (J McKeon 40); L Culliton, D Loughnane (M Fallon 44); O McCloskey (B Burna 58), G Meagher, J Cronin.